PHOTO CAPTIONS: 1. Culture clash between first-world cruise ships and third-world fishing village, 2. iceberg climbing walls after the tourists leave, 3. Norm's Place, a converted French fort, 4. the major activity at Norm's is relaxing in a hammock, 5-6. Our room. Labadee, a small fishing village on the scenic northern coast, was the perfect place to spend Valentine’s Day. 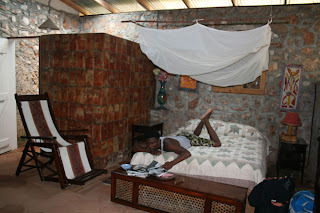 We stayed at Norm’s Place, a converted French fort, owned by an American WWII vet and his charming Haitian wife. 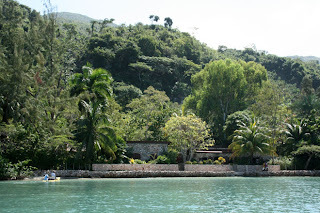 The truck ride from Cap-Haitien takes about 40 minutes over rough roads, then the last five minutes are done by boat. 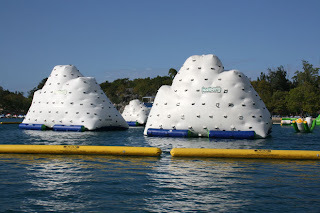 Labadee looked like Gilligan's Island at first glance. Until you notice the huge cruise ship docked in the bay. 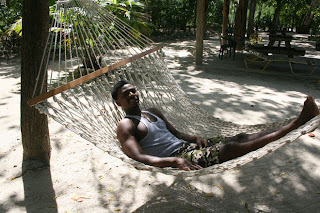 Very quickly, we realized that village life in Labadee revolves around the Royal Caribbean cruise, which brings in lots of jobs and money for the locals. 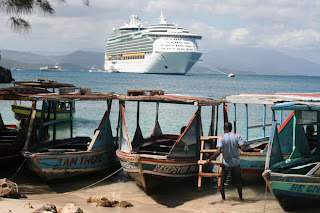 Because of Haiti’s reputation as a violent and unstable country, the cruise literature refers to it as “Labadee, Hispaniola,” which is the name of the island that Haiti shares with Dominican Republic. Royal Caribbean owns a beach, which they fence off and guard. Inside the gates, it looks like fun, fun, fun with water park, slides, inflatable climbing walls shaped like icebergs, palapas, lounge chairs, and happy Haitians serving drinks and selling souvenirs. I was hoping to get in and use some of the facilities or at least check out the scene, but we found out that the public is welcome only on the weekends when there are no cruise ships. They charge a reasonable entrance fee for school groups and foreign diplomats, charity workers, and locals, which I would have liked to do, but we had to leave too soon. Norm and Angelique, our hotel owners, sell Haitian arts and crafts inside the compound. A local boat taxi ferries them back and forth. Their shop is one of four that have set prices. They pay $80 a day in rent, so sometimes they just break even, but they enjoy it. There’s a separate flea market of 500 vendors who pay $5 a day to hawk their goods. After reading the online responses from cruise ship passengers, it seems the local vendors can get pretty aggressive and you have to bargain hard to get a decent price. Royal Caribbean also offers other activities for an extra charge, like jet skiing, kayaking, zip line, scuba diving, and the water park. We enjoyed watching grandmas and grandpas ripping around the bay on jet skis. I hadn’t seen so many white people in a long, long time, so I couldn’t help but stare through the fence at them. Each evening, after the ship sets sail, the employees pile back into the boat buses to return home to Labadee village, loaded up with surplus food from the cruise ship’s beach BBQ. It seems to me that they must make a pretty profit off of the hamburgers, hot dogs, fresh fruit, packages of cheese and crackers. We bought some Washington state apples – the best apples I’ve had since leaving home five months ago. We got lucky and caught a ride back into Cap-Haitien with Norm. For 83 years old, he’s an expert driver, especially on that rough, rocky, windy road. About 15 years ago, when gasoline was hard to come by, he used to hike up and over the mountain in 45 minutes – which is how long it takes in boat/truck. He’s lived in Haiti for 32 years and speaks fluent Creole. As much as I love to travel, I don’t think I could leave Santa Cruz permanently. I’ll be glad to get home for a while. I'm interested in visiting Labadee in May. Do you have a number or email for Norm's place? I'd also like Norm's email or number please.